In 1901, landscape architect George Kessler created plans for a parkway system like those in Boston, New York, Chicago, and San Francisco. Overton and Riverside Parks were connected by long, leafy avenues in a formal pattern that preserved green spaces and provided a dominant grid pattern, giving shape to the City's eastward expansion. The parkway system is listed on the National Historic Register and has long been a source of pride among Memphians. 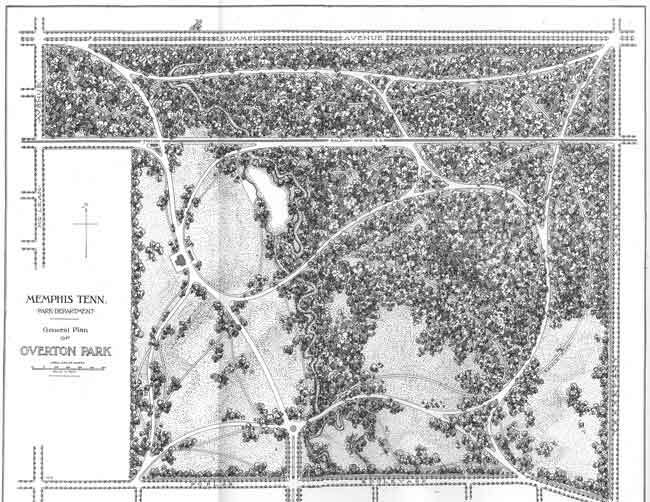 Associated with the Progressive era and City Beautiful Movements of the late nineteenth and early twentieth centuries, the development of the Memphis Park and Parkway System laid the foundation for municipal park systems across Tennessee. The Memphis system also represented one of the earliest efforts in the South to introduce basic concepts of modern comprehensive urban planning and design by George E. Kessler (1862-1923), widely regarded as one of the fathers of urban planning in America. "Landscape architect George Kessler of Kansas City designed a shoplace in Overton Park with winding drives, a large virgin forest, wide grassey meadows, and a lovely pavilion. A golf course was added in 1904."